On Sept 20th, FBWEV Members and Volunteers helped the parishioners of St. Paul’s Parish with the fall planting of their gardens. 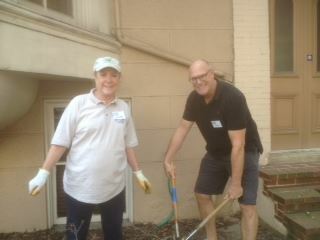 Members and volunteers cleaned the flower beds on K St. and planted fall annuals. After a morning of hard work all were treated to a festive lunch provided by the parish. The Villagers were honored to help beautify our common campus.